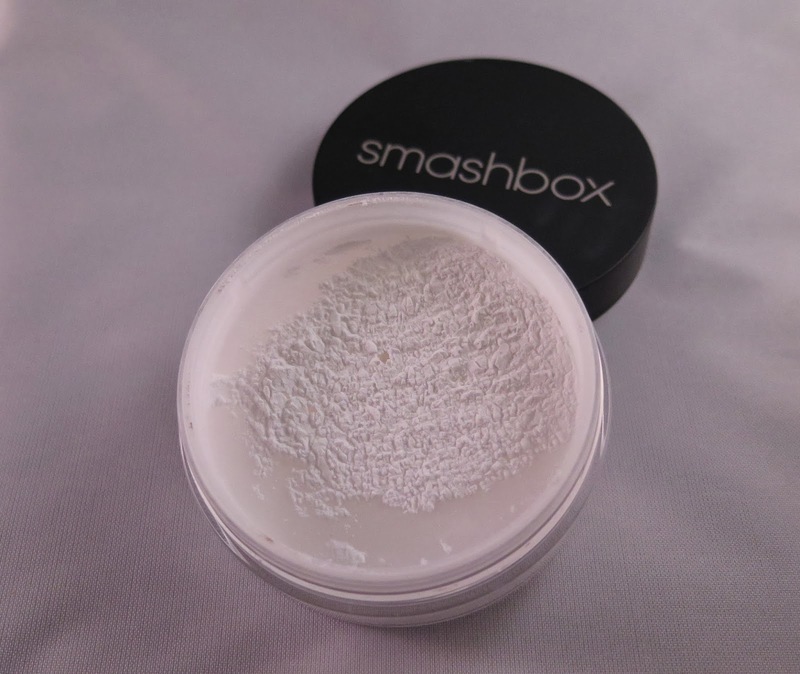 I wanted to do a quick review of the Smashbox Photo Set Finishing Powder, this is my second tub of this product because I fell in love with it and decided I wasn't going to shop around when I was really happy with the product I was using. 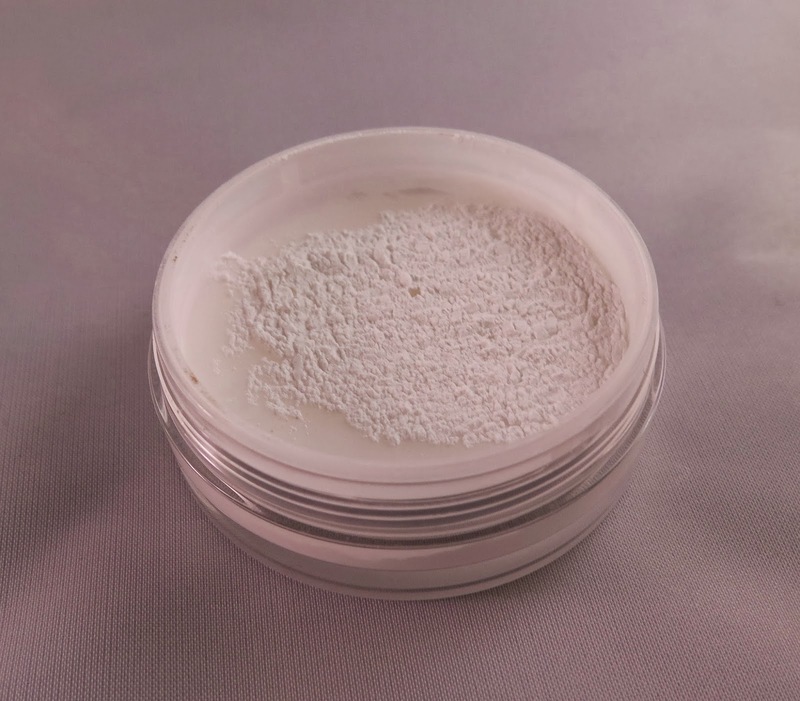 This is a completely translucent powder so is great for all skin tones. It has such a fine consistency that it goes on so smoothly and leaves a velvet finish to your skin and it just looks beautiful. It comes up so well in photo's and seems to soften the light on your skin and make it look flawless. It's also fantastic at controlling shine and absorbing oil, when I apply this in the morning I rarely have any issues with shine by the end of the day and my foundation is still in tact. The product contains silica which blurs fine lines, and is probably the reason it gives such a lovely soft finish to your skin, it also has an SPF 15 rating which is an added bonus to help guard your skin against UV and lets be honest we all need help in that area so we don't end up too wrinkly in the future. 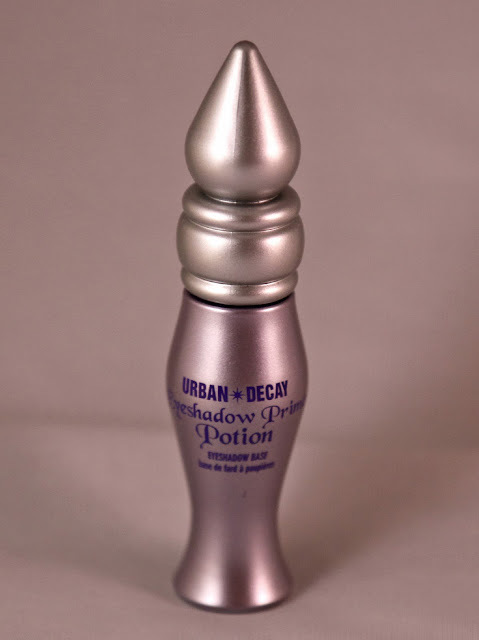 So I am not going to flog a dead donkey here, you will have heard of/used Urban Decays primer potion unless you have been living under a rock. I just wanted to share my experience with the product. I will explain why I haven't used an eyeshadow primer up until now, I have never had any trouble with oily eyelids or shadow creasing so I have never felt the need to use a primer. But as I have been getting a little older I have noticed my eyeshadow creasing a little more by the end of the day and it looks horrible. I got a small tube of the primer potion last year with my naked palette and it has been shoved away at the bottom of a make-up bag, until last week that is. I had looked at the eyeshadow that had fallen into the creases on my eyelids and thought "urgh god I have got to do something about this" so I gave the primer a try. I seriously had no expectations about it, but the end of the day rolled around and my eyeshadow was absolutely perfect, not a single smudge or crease! Amazing! Not everyone will need a eyeshadow primer, if you have no issues with your eyeshadow creasing or fading then I don't see any point in layering on a product you don't need. But if you do experience any of those problems or you want to wear a bright colour that you want to make the most of, then I really recommend it. Here is the difference it can make to the look of your eyeshadow colour, it of course gives a good base for the colour to cling to so it stays in place but it will also make the colour stand out a little more, think about the way you would use a white primer before painting a piece of furniture or wall, it really makes the colour pop. 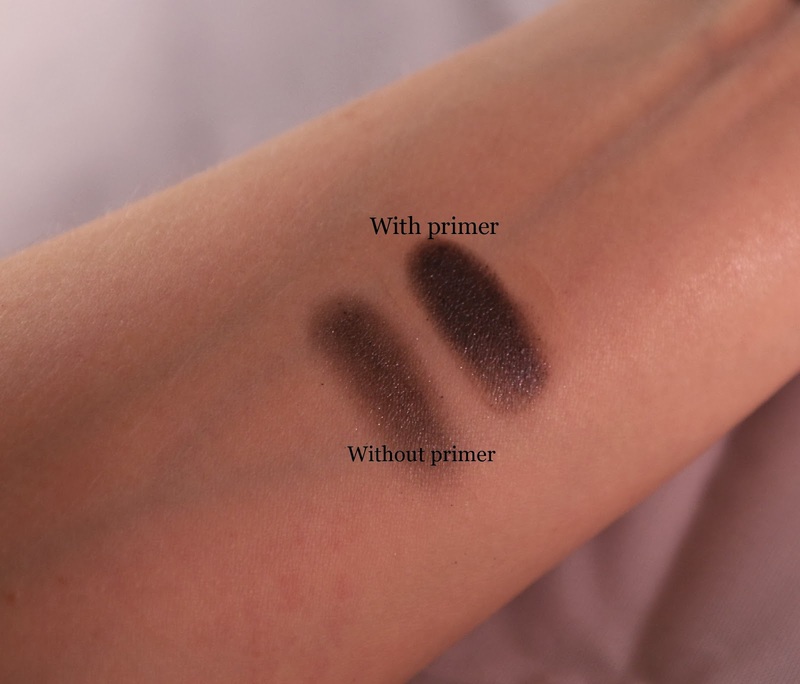 You can see how much darker the colour looks on the right, the exact same amount of product was used each time, so it could make your favourite eyeshadow go a lot further as well. I also noticed how much harder it was to get the primed shadow off with make-up remover, this goes to show the longevity it will give you throughout the day. I may spread my primer wings a little now and try a few different brands and see how I get on. Can you recommend any that you really love? 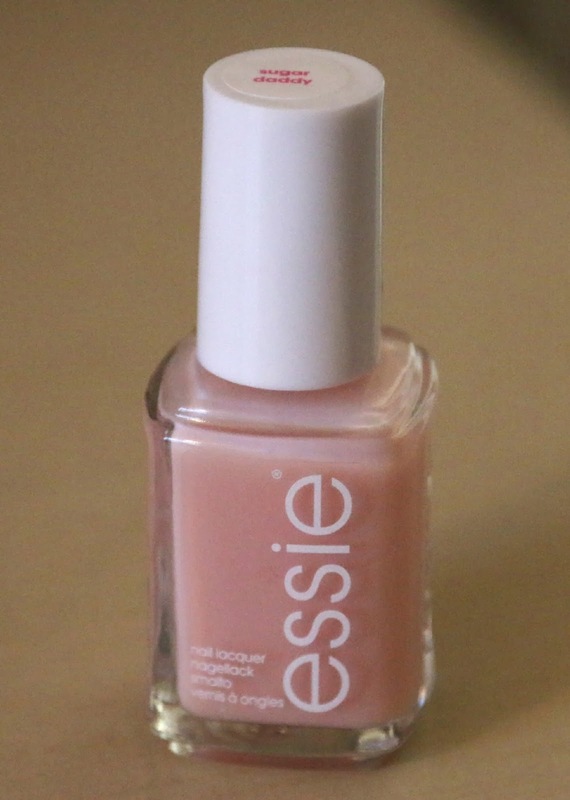 I was in need of couple of pale pink nail varnishes for a wedding I did the hair, make-up and nails for last weekend. So I nipped into Boots and bought a couple of Essie colours one of which was Sugar Daddy. I really love the Essie formula and find it goes on beautifully and lasts really well without chipping, I also like that Boots stock a really good range of colours which is handy as I'm not a massive internet shopper, I prefer to look in shops and see things in the flesh. I understand I am in the minority with this, but I am very much a person who shops with all their senses and I like to be able to pick things up and feel the packaging and see it properly. Especially as colours can seem very different in real life than they do in a photo. Anyway back to the point, Sugar Daddy is a really subtle colour and when you paint your nails with it other people wouldn't even know you have polish on. It looks so natural but in a really good way, it makes your nails look lovely and healthy. 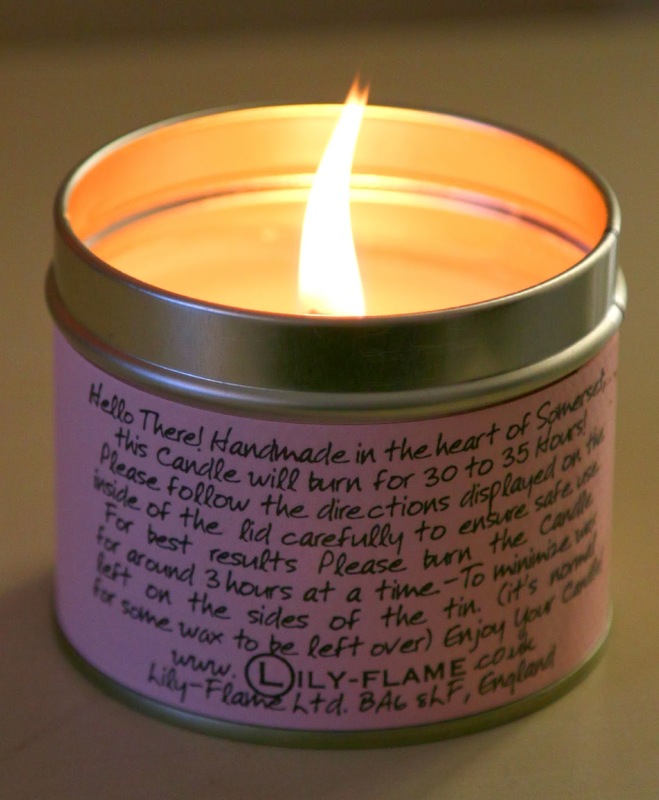 It's a pretty sheer pink that leaves your nails looking fresh, shiny and naturally 'frenched'. I have to admit that when I first put it on I was a little disappointed because I was expecting a 'colour' so to speak, but after a couple of coats I loved the way it looked and had no regrets about picking this colour up. Do you like the colour? Yesterday I spent the day in the west-end with my boyfriend, we decided to have a little festive Christmas outing, and visit Winter wonderland as he had never been. The portions are actually quite big, and I only managed to eat about half of my breakfast and I was feeling really full up. The menu is fantastic, and has something for everyone and I would really recommend it, I have never been disappointed with their food. We made our way over to Winter Wonderland which is crammed with food stalls and places serving mulled wine and hot cider, so it would have been rude not to join in and have a little drink, and some cheeky churros with chocolate sauce yum! The rest of the day was spent wandering around the shops of Regent Street, Oxford Street and Covent Garden, where I fell in love over and over with lots of beautiful things. I was obsessed with the above bag by Michael Kors, the leather was as soft as butter and it was such a stunning little bag, but I was just so reluctant to get it in the blue because I was worried about how quickly it would go out of fashion, and sadly they had sold out of the bag in black. What do you think? I don't usually think about things like this ahead of time, but this year I feel a little different and have decided that I will not just throw things on at the last minute and look like a hot mess, I will think it through and plan and choose clothing appropriately . On Christmas Eve I am usually running around doing last minute things, picking up flowers so they are at their freshest and dropping off gifts. We have made plans to go out for dinner that night when I have completed said running around, so we can spend some quality time, have some nice food and a couple of festive "lemonades"! I would like my Xmas Eve outfit to be comfy as I will be hauling myself in and out of the car, moving at pace for last minute bargins etc. I was thinking something like the combo above for the day time, jeans teamed with a festive jumper and some comfy winter boots. 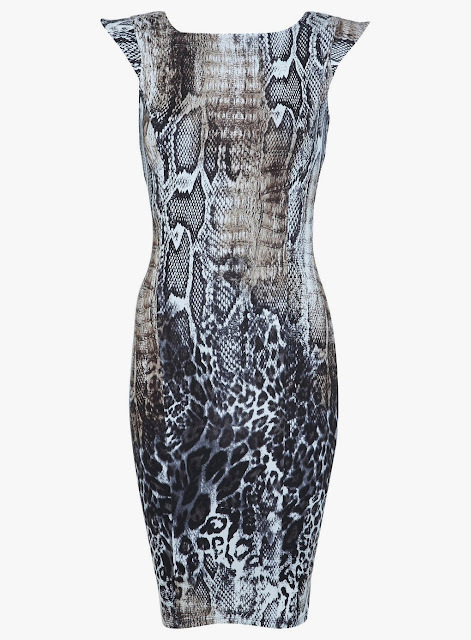 It will great for running errands in. Then I can just swap out the boots for some heels for the evening and add a bit more jewellery, some waves in my hair and some festive lipgloss, ready for the mulled wine and mince pies, yum!